Motorola a Lenovo company has Launched Moto C Plus in India today. Priced at 6,999 Moto C Plus will be available online exclusively at Flipkart from 20th June. As a Launch offer Flipkart offering extra 20% extra Off coupon on Purchase of Moto C Plus which is valid on Flipkart Fashion. Customer can also buy Motorola Pulse Max wired headphones by Paying Rs 749 along with the Moto C Plus as a bundle offer. In addition to this Jio Prime members will also get 30 GB of extra data on Reliance Jio 4G network. Moto C Plus sports a 5inch (720x1280 pixels) HD display with micro-textured finish cover on the back. It is powered by 1.3 Ghz 64-bit quad core MediaTek MT6737 processor with Mali T-720 GPU coupled with 2GB of RAM and 16GB of native memory that can be further expendable upto 32GB via microSD card. For Photography department Moto C Plus offer 8MP Rear Camera with Dual Led Flash, f/2.2 aperture, 1.12 micron pixels, autofocus, 71-degree field of view, and for selfie lovers it consist 2MP Camera on Front side along with f/2.8 aperture, 63 degree wide lens for group selfies and a LED Flash. Under the hood, the smartphone houses a 4000mAh battery with quick charge function that company claims can last upto 30 hours. The Moto C Plus runs on latest operation system Android 7.0 Nougat. Connectivity options include Wi-Fi, GPS, Bluetooth, 3.5mm headphone jack, FM, Dual-SIM, and 4G VoLTE. The biggest competitor of Moto C Plus is Redmi 4 which is already present in the market because of its price tag. Even Redmi 4A is available at Rs 1000 less. 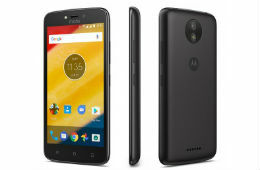 Both the Smartphones offer better specs in terms of processor make, battery power and Camera as compared to Moto C, now its depends on the customer which one they prefer.